� 35 lb. (15.9 kg) capacity: Suitable for many medium and large tools weighing up to 35 lb. (15.9 kg), including magbase Drills, wrenches, and pipe thread drives. 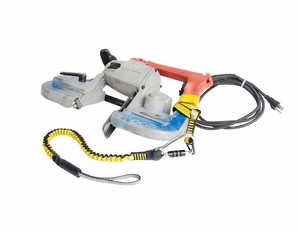 � Simple cinch design: Simply pass the attachment point through a closed handle on a tool, then pass the ring end through the loop end to create a power cinch. � Stabilization wings can be used to secure cinch in place: Two stabilization wings can be secured to a tool using 3M� DBI-SALA� Quick Wrap Tape to prevent the tool cinch from slipping during use.